Toyota's global sales of hybrid vehicles have passed the four-million mark, according to company figures released today. The milestone, which includes Lexus hybrids, was achieved in late April with the latest million being sold in just 14 months. Global demand for Toyota's hybrid vehicles is accelerating rapidly with more than 425,000 sold in the first four months of 2012 - more than two-thirds of last year's total. So far this year, hybrid vehicles have accounted for 15 per cent of Toyota's global vehicles sales. This puts Toyota on track to sell more than one million hybrid vehicles in a year for the first time in its history. 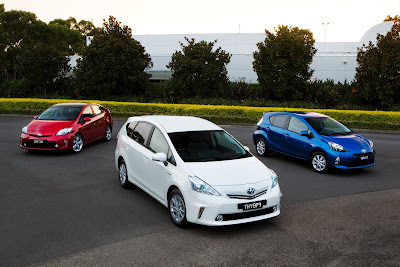 The announcement of the latest milestone closely follows the introduction of the Prius v and Prius c to Australia, along with launches of an upgraded Prius and the second-generation Camry Hybrid. The total includes more than 2.6 million Prius and 270,000 Camry Hybrid, while the two newest hybrids - Prius v and Prius c - have already reached the combined total of approximately 250,000. After releasing its first hybrid vehicles in Japan in 1997, Toyota took almost 10 years to post the first one million sales. The second million was sold in two years and three months, and the third million in just 18 months. The third million milestone was reached in February last year.